HS-1371 is a novel kinase inhibitor of RIP3-mediated necroptosis. HS-1371 directly binds to RIP3 in an ATP-competitive and time-independent manner, providing a mechanism of action. Moreover, the compound inhibited TNF-induced necroptosis but did not inhibit TNF-induced apoptosis, indicating that this novel inhibitor has a specific inhibitory effect on RIP3-mediated necroptosis via the suppression of RIP3 kinase activity. HS-1371 could serve as a potential preventive or therapeutic agent for diseases involving RIP3 hyperactivation.
. Park HH, et al. 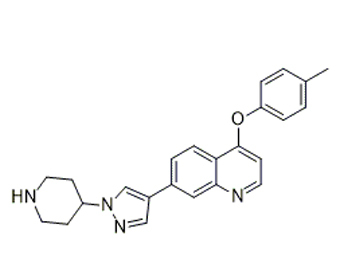 HS-1371, a novel kinase inhibitor of RIP3-mediated necroptosis. Exp Mol Med. 2018 Sep 20;50(9):125.